St. Timothy was a timid, affectionate young man, and a faithful follower of St. Paul. He is part of the early Church. We celebrate January 26 as his feast day. Timothy was the son of a Greek father and a Jewish mother. His convert mother raised him as a Christian. Born in Lystra, in present day Turkey, he probably embraced the Christian faith during St. Paul’s first visit to Lystra. On a return trip in the year 50 A.D., Paul found Timothy so esteemed by the local Christians that he asked Timothy to join him in spreading the Gospel on his missionary journeys. He was consecrated a priest and eventually became the first Bishop of Ephesus, a thriving city of the Roman Empire. St. John Damascene, in 675 A.D. wrote that Sts. Timothy and John, the beloved disciple, were witnesses to Mary’s Assumption. Timothy died a martyr in the year 97A.D. Because of his frail health he is the patron of those with stomach disorders. St. Paul writes, “Stop drinking water only; take a little wine for the good of your stomach and your frequent illnesses.” (I Timothy 5:23). 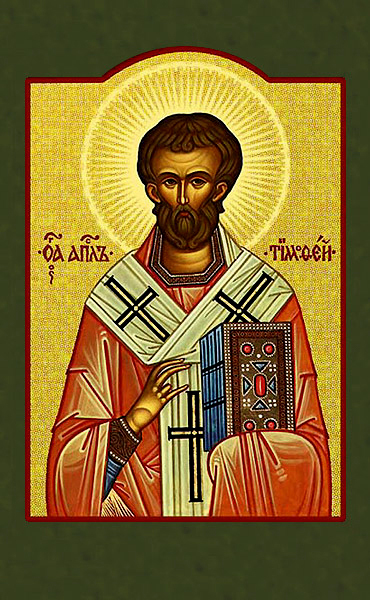 St. Timothy is the co-writer of Thessalonians, 2 Corinthians, Philippians, Colossians, and Philemon.